We weren’t off to a brilliant start for our first WordCamp Europe with our flight to Vienna cancelled due to…faulty toilets! Nevertheless, after an unexpected visit to Munich we did eventually make it to Vienna and arrived at our charming AirBnB apartment pretty quickly. It was a great location about 10 minutes walk away from the conference venue, the 35º heat made that walk a little uncomfortable but considering the British weather this summer we’ll take any sun we can get! We had planned in an extra sightseeing day after the conference had finished so we could focus on the task at hand first – WordCamp Europe! The more WordCamps I attend, the more I am drawn to the business talks. I spend far too long on Dribbble and in various design communities, we can usually solve our development problems inhouse or on StackOverflow but the business-end of things often has me feeling like I’m wandering alone in the wilderness. So, as with Wordcamp London, my highlights were the talks by other agency owners. The stand out talk coming from David Lockie, founder of Pragmatic, one of the UKs largest WordPress agencies and a Gold tier WooExpert (something we aspire to be one day!). His talk on ‘The Discovery & Definition Approach to Project Planning‘ was really eye-opening, he talked about the gap between our thinking and the clients thinking when discussing a project and the process of making sure there are no surprises or mismatched expectations near the end of the project. I absolutely love solving client problems and turning around failing stores, but I think that sometimes my enthuasism to jump in has left too many questions unanswered – leading to extra work that we hadn’t planned for. By implementing a thorough discovery process to a project, we can come out the other end with a happy client, a happy agency and as a bonus – we’ll have all met our business objectives. David’s talk was actually the last talk in a Saturday morning packed full of quality talks aimed specifically at agencies, all of which were really useful for me. One other stand out talk from the morning was ‘How we built a successful, distributed WordPress firm serving nonprofits‘ by Lesley Molecke of Cornershop Creative. She spoke about their journey as an agency, how they began (literally including screenshots of their very first ‘chat’) and why they chose to do what they’ve done. It left me very motivated to grow the business further, they seem like a really lovely team who have a great deal of respect for one another and thoroughly enjoy working together. My final recommendation for freelancers and agencies in our space is to watch a talk by Tomaz Zaman, the founder of Codeable, called ‘You are too cheap‘. Before any clients reading this begin to panic, the talk was not just about underselling yourself, it was also about how techy people need to stop talking about technical implementations to our clients and start talking about solving business needs and finding out how we can deliver real value to our clients. This is something that I feel we are already very good at, in eCommerce it is very easy to measure the return from a project and we love to give store owners a fantastic return on investment. However it is always nice to have your methods validated and Tomaz is an outstanding speaker. 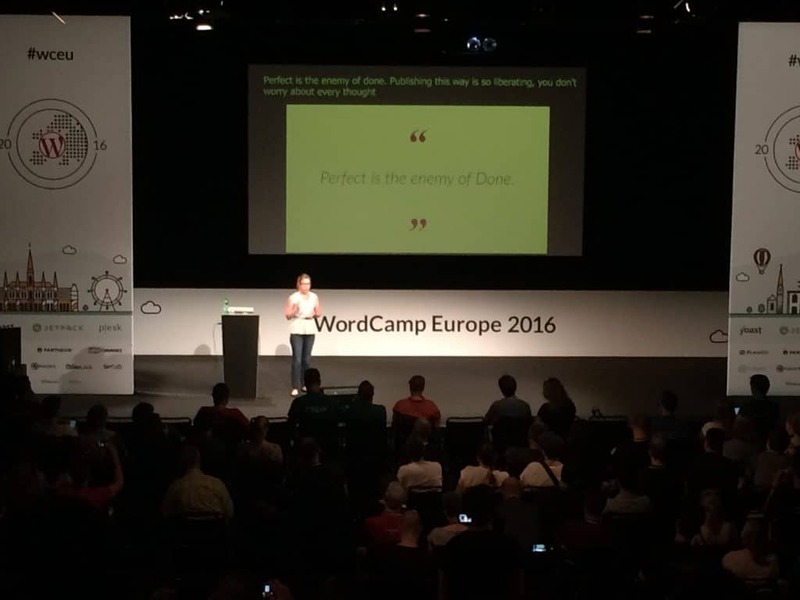 As usual, the schedule at WordCamp Europe 2016 was full to bursting with great talks on a range of topics. There were a few real stand out talks for me, the first of which was the business panel on Friday morning about cultivating happy teams for better business. It was great to see that so much of what we strive for in our business culture and lifestyle aligned with theirs and pick up some new ideas for developing our team. All too often things just don’t get finished because we’re sure we could make them just a little bit better, but as she said, ‘perfect is the enemy of done’ and sometimes it’s better to pragmatic about these things! I also love love loved Tomaz Zaman’s talk ‘You are too cheap’ but Phil’s already told you about that! However, my absolute favourite talk was a little off-topic I guess but not entirely unrelated to what I do day-to-day. Shiobhan McKeown gave a passionate and insightful talk about how we communicate online in the 21st century and how the echo chambers our online communities form lull us into a sense that everyone aligns with our views. In light of the recent referendum results she actually changed the end of her talk and it really hit home with me – a very emotional 30 minutes. Now, to talk about Vienna – it’s beautiful, I mean really beautiful. The imperialist architecture, lavish mansions and palaces and art culture at every corner was wonderful. My highlight would have to be the history lesson we got on the bus tour around the city, it’s definitely got me wanting to find out more about the history of the Austro-Hungarian Empire. So fascinating to hear that the likes of Trotsky, Lenin, Hitler and Freud were all living and socialising within a square mile of each other in Vienna, mindblowing. As usual we had planned, almost to an extreme, our individual schedules and mine began with one of my favourite topics, the WordPress Command Line. Marcos Schratzenstaller gave a talk called ‘WP-CLI for beginners’. I have written a blog post before about my adventures with the WP-CLI and I would be the first to tell you that I am in no way an expert with the WP-CLI. Marcos gave a great overview of the capabilities of the WP-CLI along with a whole host of commands, complete with working examples. It really opens your eyes to the sheer capabilities of the WordPress Command Line! Following on with the same topic, of the WP-CLI, another great talk from the weekend was one of the last. ‘My condolences, you’re now the maintainer of a popular open-source project’ by Daniel Bachhuber. Daniel is the maintainer for WP-CLI. His talk didn’t go into any technical details about the WP-CLI, instead it was about the pressures and the responsibility of maintaining a piece of open source software. We have released a few plugins ourselves and have many more planned, so this was a real eye opener about the proper way to look after your work, and how to get the most out of it, for both yourself and the users. Last but most definitely not least, the WP REST API. Joe Hoyle, one of the main contributors for the REST API gave an hour long talk about the complete ins and outs of the WP REST API. For somebody like myself who has heard all about the REST API, but doesn’t really know anything about it, this was a perfect talk. Joe went into detail about everything that is possible with the REST API and what will be coming in the future. Joe topped this talk off nicely with a demo of his new open-source native iOS app, aptly named ‘Vienna’. This app was built in React native and uses the WP REST API to interact with WordPress. Lets just say it went down a storm! 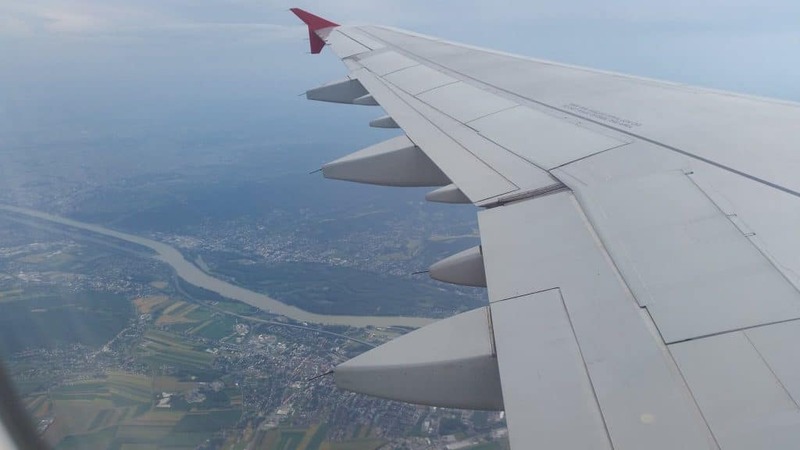 Thankfully, the whole team at HappyKite stayed in Vienna for a bit longer to sightsee, after all it would be criminal to stay in Vienna and not tour around the city! After exploring, and getting rather sunburnt, one thing really sticks in my mind, just how unique Vienna is. There are clearly several different cultures and styles alive at the same time, the buildings and the architecture are enough proof of that! 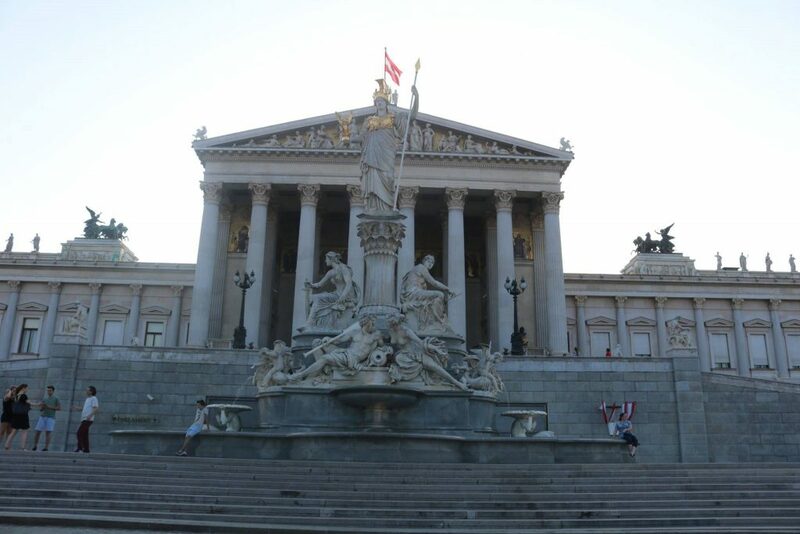 My favourite part of Vienna, other than the little shop down the road from our apartment, has to have been the Parliament. It was such an eye catching building, really unique. 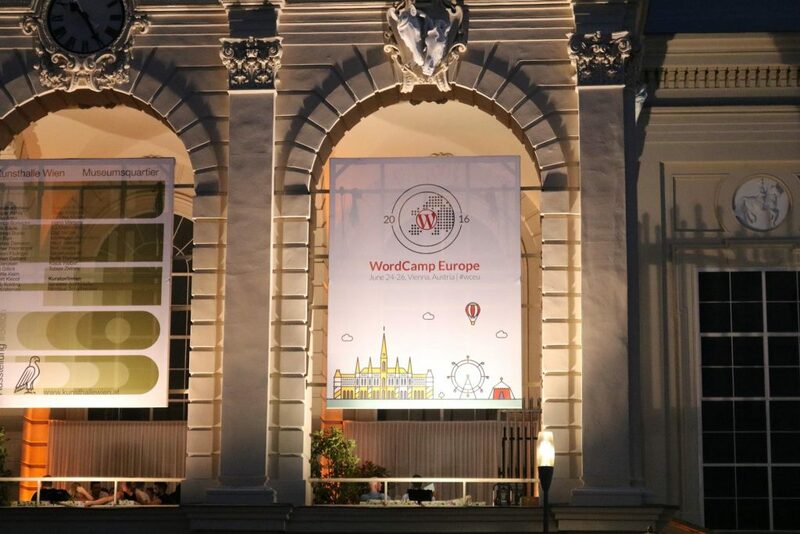 We hope to see you at WordCamp Europe again next year in Paris!